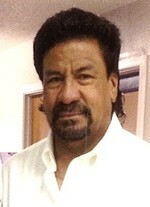 Esteban “Indio” Saldaña, 64, of Andrews passed away on Tuesday, October 30, 2018 in Andrews with his family by his side. Family and friends will gather to celebrate his life at 2:00 PM Friday, November 2, 2018 at McNett Funeral Home Chapel in Andrews. Interment will follow in the Andrews North Cemetery. Prayer services will be held at 7:00 PM Thursday at McNett Funeral Home Chapel. Please celebrate his life by visiting www.mcnettfuneralhome.com. Esteban was born on September 13, 1954 in Carlsbad, New Mexico to Santiago Saldaña, Sr. and Josefa Castillo Saldaña. He has lived in Pecos, Muleshoe, and Andrews since 1971. He had worked at Kirby West and in the oil field as a roustabout and as an operator-driver for pulling units and drilling rigs for Pool, DA & S, R & H, Key, and Well Tech. He loved to gamble at the casino, lottery and scratch off tickets, dancing to Tejano music, and helping people in whatever they needed. He was collector of many things especially scrap metal, and many would go to him like he was the flea market or for anything they needed. They will remember him like he was “Sanford and Son”. He enjoyed all sports on TV, especially the Green Bay Packers, New England Patriots and the Texas Rangers. Most of all, he loved spending time with his family, especially his daughters. Esteban is survived by his wife, Juana Mesa Flores of Andrews, 4 daughters, Ruby and Nathan Jarvis of Lawton, Oklahoma, Margo Saldaña of Lawton, Oklahoma, Carmaleta Saldaña of Oklahoma City, Oklahoma, Estefani Saldaña and her fiancé, Fernando Dueñez of Carlsbad, New Mexico, 1 son, Sidney Mihecoby of Geronimo, Oklahoma, 5 siblings, Maria and Richard Salerno of Andrews, Francisca Madriles of Andrews, Alejo and Adelaida Saldaña of Andrews, Susy and Marcus Rushing of Sweetwater, and Jesus J. and Aurora Saldaña of Andrews, 11 grandchildren, and 9 great grandchildren. Esteban is preceded in death by his parents, son, Esteban Saldaña, Jr., brother, Santiago Saldaña, Jr., sister, Anita Saldaña, brother in law, Pedro Madriles, nephews, Francisco “Kid” Estrada and Manuel G. Saldaña. To send flowers to the family of Esteban "Indio" Saldaña, please visit our Heartfelt Sympathies Store.